When you purchase an above ground pool, there are many items to consider; filter, pump, ladder, skimmer, chlorine holder, and more. But the liner is the largest part of your pool besides the pool walls and there are numerous choices that include how durable the liner is and the patterns and colors that will match your outdoor décor theme. Whatever needs you have for your pool; we're here to help you buy the best above ground pool liner available! The two main pool liners are beaded and overlap liners and we'll talk about those in this article along with other considerations such as liner thickness, expected lifespan, warranties, and style. So read on and learn about which liner will work for your pool the best! Smartline manufactures this 24 foot round pool liner with high quality vinyl and multiple seams to be sure stretching does not cause a tear. The middle seam of the liner makes it easy to line up the center of the pool and roll out for easy installation. This is a high quality liner with an assortment of designed and colors. Dolphins, Caribbean fish and flora, bedrock and even waterfalls decorate these high-gauge liners all with a 25 year limited warranty. Smartline designs and produces these liners with layers of virgin vinyl and Lamiclear technology to protect the liner from UV damage and to keep the designs from fading. Truly a superior pool liner! Several customers found this liner was too small and did not have enough overlap. This 24 foot round overlap liner is made from premium quality virgin vinyl and has built-in protection against the damaging UV rays of the sun. This prevents fading and the liner from ripping. This comes in five different sizes: 12, 18, 24, 28, and 30 feet round and will fit pool walls from 48 to 52 inches high. The 20 mil material looks beautiful once installed and with double-welded seams, it's sure to last for years to come. 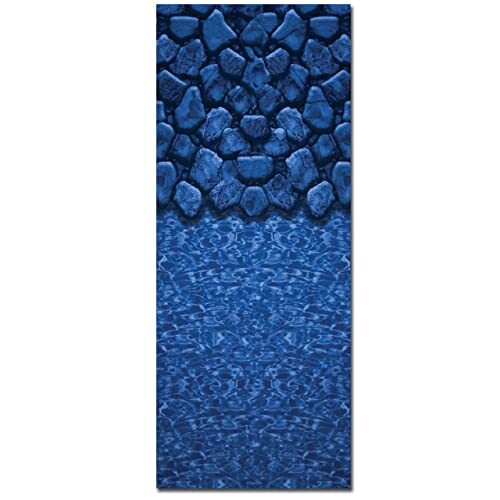 The Smartline StoneHarbor 24 foot round UniBead liner is printed with a tiled bottom design in shades of blue that leads up to intercepted marble style tiles. The Made-in-America vinyl is hand-folded at the factory before being packed to prevent creasing and wrinkling. With the deep colors of this liner and the durable heat bonded vinyl, you know you're getting a long-lasting investment for your pool. This is a UniBead liner and simply snaps into the track on your pool. There's no cutting of overlapped material. Also comes in one other blue style, Aspen Creek. Pool owners complained the liner was too large in diameter causing some wrinkles. The Smartline 18 foot round overlap liner drapes over the pool wall and then secured by coping strips. (coping strips are not included) There's plenty of vinyl to give or take and make the liner fit properly before attaching it to the pool wall. You have the choice of ordering either a 20, 25, or 30 mil thickness and as with other Smartline overlap liners, there are assorted designed to choose from. From Sunlight which looks like sun bouncing off the bottom of the pool to a waterfall at the top of the liner or fish along the wall, you will find the style you love! Numerous designs to pick from! This liner seems to run a little large and some people did not like the amount of wrinkles this caused. As with all Smartline liners, this oval overlap liner is made from 100% virgin vinyl material and is heat bonded and vacuum sealed for long lasting wear. All the seams are lap welded and ensure no tearing when the liner is stretched. This Smartline liner comes in many oval sizes and several round pool sizes. 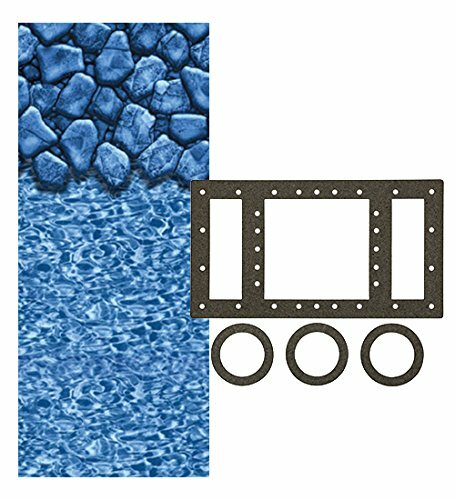 Included with this product is a universal gasket set for the skimmer. It works with standard sized skimmers or wide mouth openings and comes in handy when changing a liner. Some gaskets can dry out becoming cracked and may leak. The gasket included with this liner is not included at times. There are a few important pool liner factors that will influence your decision when buying a liner for your backyard pool. Whether you have an overlap liner or a beaded pool liner limits the type you purchase. The other details such as thickness, texture, colors, and warranty are also pertinent. We've researched the information you need to make a decision and also reviewed the best liners we found! Typical backyard pools have an overlap liner, one that drapes over the pool wall and is secured with plastic coping strips. The top rail is placed on top of this and the liner is securely held in place. Extra liner that overlaps can be trimmed off once the liner is in place. A beaded liner is topped with beads that run on a track round the pool and hang inside the pool. These liners don't have extra wall height so they have to be ordered specifically for your pool. A common backyard above ground pool height is 48 or 52 inches. Be aware when ordering a replacement liner for a beaded track that some manufacturers use different size beads! Whatever you choose; overlapped or beaded, the liner's thickness is more important and of course, the size. Overlapped or beaded will determine the type and size of the liner. If you're ordering a new pool 'package' it's likely all the elements of the pool setup are included like the liner. If you're creating your own pool setup or replacing your liner, it's essential you measure the pool exactly according to the liner you need. Even with a diagram of the pool and the size, always measure the physical pool wall itself. For first-time setup, the liner size will match the pool wall dimensions. Remember one very important rule: Measure twice … order once! To measure a round pool for a liner, use a measuring tape or rope to reach straight across the center of the pool, keeping the measuring tape or rope taunt. Always measure from the inside walls at the top. Do this in at least three different places as not every pool wall will be exactly even around. Mark this measurement down on a piece of paper and then measure again. This will be your diameter. For an oval pool, you will need to measure the length of the pool from end to end at the center of each end first. Then, measure the width in 3 to 4 places and average this number. Be sure to measure from the inside wall near the top. This will take into consideration the variance of the width. Once you've written these measurements down, take them again! Rectangular shaped pools aren't as common but the measurement will be the same as for the oval pool, measuring the length and width. Be aware that rectangular pools may have one of three types of corners; square, diagonal, or rounded. Stock size liners for rectangular pools typically have square corners. The last measurement you will need is the height of your pool wall or the depth of the pool. Always measure from the outside of the pool; going from the bottom rail to right under the top rail. Measuring from the inside will be skewered by the bottom sand or thickness. Above ground pools are normally 48, 52, or 54 inches deep. When ordering an overlap pool liner, the manufacturer will have already taken into consideration the overlap needed for each pool shape and size. When looking at the pool liner thickness you may see a number marked as 'mil' or 'gauge.' Don't let this throw you off—mil and gauge are the same. A basic pool setup comes with a 20 mil pool liner which is sufficient and will last for years. To visualize the thickness, a standard sheet of paper is 10 mil. Double that sheet and you have the thickness of a 20 mil pool liner. The thickness you choose for your liner depends on several factors; pool location, sun exposure, and what surface the pool will be installed on. For pools that are located in an area that gets most of the daytime sunlight or are installed on top of concrete, you are better upgrading to a 28 or 30 mil liner. It may cost you up to 10% more, but the difference in thickness is upwards of 32% making the liner more durable and longer lasting. Liners any thicker than 30 mil may be difficult to work with when installing because the extra thickness doesn't allow for as much give when stretching the liner across the pool wall. It's likely you'll have your backyard above ground pool for years to come. Many people enjoy creating a tropical haven around their pool to set the vacation mood. Stay-cations are the trend and keeping everyone happy right at home is a great choice. Liners come in all sorts of colors, designs, and even textures. See if you can check out pools already setup to see how the different colors and patterns sparkle and reflect light while in the sun. Pick a main color such as light blue, deeper teal blue, dark blue or other shades that will compliment your yard. Then you can choose from many patterns for the bottom of the pool or partly up the side to mimic natural stones, shells, jewels, or marble. Part of the benefit with patterns is they often come with a texture so the bottom of the pool is not as slippery. Decide on the style and texture as your final choice. The warranty on a pool liner will not be like an appliance with a 2 year limited warranty. A pool liner warranty is very important. The minimum warranty is typically 25 years and indicates that failures in the vinyl and materials make the liner replaceable. Rips, tears from abuse, weather damage, or damage during installation are not typically covered under the warranties. Be sure when you open your liner to check for any holes or tears immediately. You can put a pool package together yourself with confidence once you learn about the different components to an above ground pool. With this article and reviews, you've learned what to look for when deciding on a liner and we've chosen our TOP PICKS for the best above ground pool liner so you don't have to go from website to website to find a good product. Buy any one of these pool liners here knowing you're getting a great find!